Rehab Or Die: Finished the laundry room floor. Finished the laundry room floor. We got some wood flooring from a friend who had some leftover from a project he was doing. Two boxes plus some extras. We have a small laundry room, so we figured what the hell, and 'free' is a pretty good price, ya know? So back in January when we were installing the floor drain and the washing machine tub, we had to have the flooring at least STARTED so we could set the tub and drain on top. We finished about ten rows, which was just enough, then we stopped. Turns out it only took about an hour to finish making the cuts and snapping them all together. Kind of embarrassing when you think it took nine months to finish a one hour job. Ah, but then the fun part. There wasn't enough flooring to finish off the laundry room closet. Turns out we've got leftover tile and grout from the 3rd floor bathroom. Time for the tile saw, thinset and grout again, and just when I was thinking about donating them on CraigsList.....not so fast, sister! So I tiled the closet. At least now we can run the trim in there now, too. Yeah!!!!! Just want to let you know about our Best Home Renovation Contest! 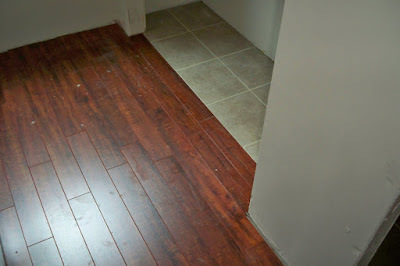 Flooring projects are great for the contest. There's a chance to win up to $2,700. And floor trim as.... door trim. Kind of. Floor trim as ... kick plate corners? Floor trim..... as window sill aprons?